Zelan is a refugee, a mom, and a talented maker. Photo by Erin Wilson/Preemptive Love Coalition. We tell Zelan not to fuss. We’ve just come from another home in the camp for Syrian refugees, and have already had cups of dark, sweet coffee. But Zelan disappears just the same, and returns with more dark, sweet coffee served in small white cups. We drink her coffee, grateful for her hospitality. The room is small. It serves as a living room and dining room during the day—thin, plastic sheeting spread over the carpet in the center of the room serves as the ‘table’ when food is served. At night, sleeping mats come out, and this room is transformed into a bedroom for Zelan, her husband and their children. They have a few other small rooms here in the refugee camp: a kitchen, a bathroom, and a guest room used by a relative. Everything is very basic, but functional. And Zelan is thrilled with it. We hear so many stories of Syrian refugees who found safety in Iraq during the long civil war back home. We hear harrowing stories of death and destruction, of grief and loss. Stories that inventory all the wonderful aspects of life they lost when they fled. That is not Zelan’s story. She and her family fled war, yes. But their situation in Syria was very difficult for them apart from the direct effects of falling bombs. They lived in a small village where work was impossible to come by. Services were scarce. Life was hard. Life in a refugee camp isn’t easy. 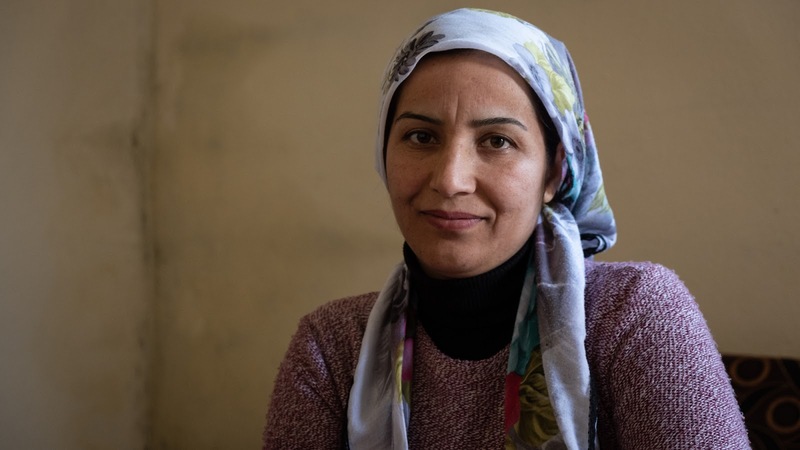 The life Zelan has built over three years in a refugee camp, far from her hometown in Syria, is much better than the life she fled. It’s hard to imagine. Zelan knitting washcloths for sale in our online shop. Photo by Erin Wilson/Preemptive Love Coalition. she graduated to more ambitious projects like sweaters, and really found her skills come to the fore when she worked up special bridal sets popular in Syria—handworked lace doilies and bedspreads that adorn a new home at the beginning of a couple’s life together. She casually mentions other types of handwork she makes–embroidering special trim to embellish garments, making jewelry and sets of prayer beads–like it’s no big deal. When we visit, Zelan is knitting washcloths that will soon appear in our online store. They are dark purple squares, with knit and purl stitches forming a basket weave pattern. Her hands work quickly and her stitches are beautifully even. I have no need for another washcloth, but watching one form on her knitting needles makes me absolutely want one. A rare moment when Zelan’s hands are at rest. Photo by Erin Wilson/Preemptive Love Coalition. Knitting and selling washcloths is helping Zelan to continue building the kind of life she wants for her children. She has safety in her refugee camp home—security and sense of peace. Zelan has good neighbors, and friendships built with other women who live nearby in the camp. She has access to water and electricity—her husband’s work as a day laborer can usually cover those expenses. But his earnings, unpredictable at best during northern Iraq’s rainy winter, can’t cover all of their needs. Zelan is working to fill in the gaps. When she finishes the washcloths and calls us to tell us that our order is ready, we’ll return to Zelan’s home to pay for our order. She tells us those earnings will become food for her family, clothes for her children, and the kind of unglamorous items every home needs—like a bucket or a new squeegee for the tile floors. Zelan works with her hands because she doesn’t want her home to feel empty. She creates things she finds beautiful to serve her family’s needs. When you hold one of her washcloths in your hands, you hold the evidence of a woman’s love for her family made tangible. Give now and help women create new lives for their families.